Practice Biomedical Instrumentation questions and answers for interviews, campus placements, online tests, aptitude tests, quizzes and competitive exams. This set of Biomedical Instrumentation Multiple Choice Questions & Answers (MCQs) focuses on “Essential Parameters for Telemedicine”. 1. Which of the following option is the correct full form of CRO? Explanation: Cathode ray oscilloscopes are widely used for the display of waveforms encountered in the medical field. These waveforms can be recorded from the CRO screen by running a photographic film through a recording camera fixed in front of the screen. Recorders are either of the single channel type or of the type which record several channels simultaneously. 2. __________has the widest range of temperature measurement. Explanation: Thermocouple has the widest range of temperature measurement from -184*C to +2300*C. RTD has a range of -200*C to +850*C. Thermistor has a range of 0*C to 100*C where as conventional mercury thermometers range is -37*C to +356*C.
3. The junction at lower temperature in thermocouple is termed as measuring junction. Explanation: The junction at higher temperature in thermocouple is termed as measuring junction. The junction at lower temperature in the thermocouple is called the reference temperature. The cold junction is usually kept at 0*C.
4. Select the correct option from below for the particular description of arrangement. When two wires of different material are joined together at either ends, forming two junctions which are maintained at different temperature, a thermo-motive force is generated causing a current to flow around the circuit. Explanation: The junction at higher temperature in thermocouple is termed as measuring junction. This arrangement is called thermocouple. The junction at lower temperature in the thermocouple is called the reference temperature. 5. What force is generated when two wires of different material are joined together at either ends, forming two junctions which are maintained at different temperature? Explanation: When two wires of different material are joined together at either ends, forming two junctions which are maintained at different temperature, a thermo-motive force is generated causing a current to flow around the circuit. This arrangement is called thermocouple. The junction at lower temperature in the thermocouple is called the reference temperature. The junction at higher temperature in thermocouple is termed as measuring junction. 6. The junction at higher temperature in the thermocouple called is measuring junction. Explanation: The junction at lower temperature in the thermocouple is called the reference temperature. The cold junction is usually kept at 0*C. The junction at higher temperature in thermocouple is termed as measuring junction. 7. What is the temperature at which the lower junction in thermocouple is maintained? Explanation: The lower temperature junction in thermocouple is maintained at 273 K (0*C). The junction at lower temperature in the thermocouple is called the reference temperature. The junction at higher temperature in thermocouple is termed as measuring junction. 8. Which is the correct formula for the resistance Rt of a metallic conductor at any temperature t ? Explanation: The resistance Rt of a metallic conductor at any temperature t is given by Rt = Ro(1+ɑt). Ro is the resistance at 0*C. ɑ is temperature coefficient of resistivity. Explanation: It is a passive sensor and requires current excitation to produce an output voltage. RTD has very low temperature coefficient.RTD stands for Resistance Temperature Device. Voltage drop across RTD is much larger than thermocouple output voltage. 10. Which of the following quantity is measured by Thermister? Explanation:Thermistors are the oxides of certain metals like manganese, cobalt and nickel which have large negative temperature coefficient, i.e. resistance decreases with increase in temperature. Thermistor is used to measure temperature. It is a temperature transducer. With change in temperature its resistance changes. Thus its working principle is variable resistance. 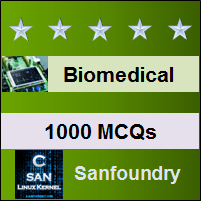 Sanfoundry Global Education & Learning Series – Biomedical Instrumentation. To practice all areas of Biomedical Instrumentation, here is complete set of 1000+ Multiple Choice Questions and Answers.